An air zoning system allows increasing the comfort and energy efficiency of an air conditioning system where a single machine is used for the heating or cooling of several rooms. Zoning allows treating each room as a separate climate zone, disabling unoccupied areas, and adjusting the setpoint of the other rooms depending on their use, to achieve a greater comfort and energy savings. How can I know if my air conditioning system is compatible with IRSC Zone? The compatibility of the system can be checked in the correspondences table that we make available on our website. If you do not find in the table the exact model of the infrared control that uses your air conditioning system, please contact us through our Online Technical Support, and send us the model and a picture of the IR remote controller. Note: Note that this list links the infrared remote controller models (NO indoor units) with a numeric parameter which must be used to configure the IRSC Zone in the ETS. My air conditioner only has a wired remote controller, how can I use IRSC Zone to control this machine? Air conditioners that are usually used in this type of systems are installed in false ceilings, so they usually come equipped with wired remote controllers; however, most manufacturers also develop installable kits to add an IR receiver compatible with IRSC Zone to the unit. If I use IRSC Zone to control my air conditioner, Can I continue using the native remote controller of the unit? No, the infrared communication between the IRSC Zone and the air conditioner is unidirectional. If the operation parameters of the air conditioner are changed from the native remote controller, the status of the unit in the KNX system results desynchronized, because the air conditioner cannot update its status in the KNX bus. Can I use IRSC Zone to control a zoning system where the central HVAC machine is a fan-coil unit instead of a split unit? Yes, it is possible to carry out this type of installations by using the IRSC Zone along with a fan-coil controller. The IRSC Zone will be used to perform all the zoning logic, and the status objects returned by the IRSC Zone to set the operation parameters of the fan-coil controller. If you have any doubt about the configuration of these systems, contact our Online Technical Support. How many zones can be controlled with a single IRSC Zone? 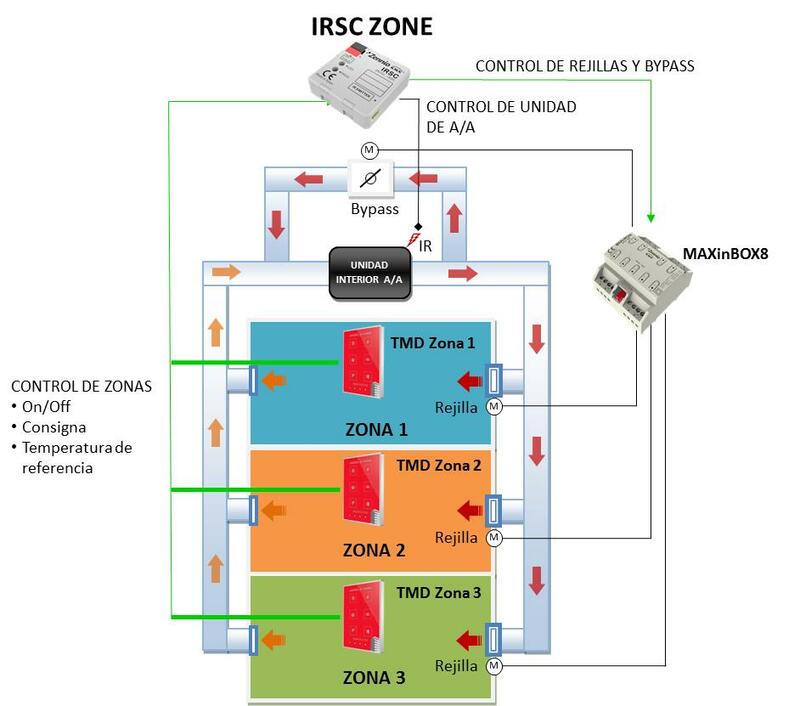 A single IRSC Zone allows you to control up to 8 independent zones. What data do I need from each zone to perform the thermostatic control? The data needed by the IRSC Zone to perform the thermostatic control of each zone are: the status of the zone (on / off), the setpoint temperature and the ambient temperature. The operating mode (auto, heat, cool, dry, ventilation) and the fan speed should only be controlled from one of the zones, the main or master one, as they must be the same for all the enabled zones. What is the bypass for? The bypass is a gate that allows the air circulation between the supply duct and return duct when the grilles are closed. This prevents the duct from overpressures that can damage the installation. Static bypass: the gate is equipped with a counterweight that yields to the accumulation of static pressure on the surface, therefore it is also often called an overpressure damper. Motorized bypass: the gate is driven by a motor. This is the type of bypass that can be controlled by the IRSC Zone. Here we show you the best way to place the IR transmitter onto the receiver of the Air Conditioning unit to control. A correct location of the transmitter will facilitate the reception of the IR frames avoiding any issue on the reception. What type of actuator is needed for the grilles to be controlled by the IRSC Zone? The grilles must have only two positions: completely open or completely closed;; IRSC Zone cannot control grilles with a proportional opening. On the other hand, it is not recommended to use grilles with a proportional opening because the air can produce noise with small openings. IRSC-Zone can perform two types of control over the grilles: 2-point with hysteresis or PWM (Pulse Width Modulation). What devices do I need to build a complete zoning system, in addition to the IRSC Zone? In addition to the IRSC Zone that will act as the main air conditioner controller, you need user interfaces in order to select the operating parameters of each zone (on/off, setpoint temperature, operation mode, and fan speed), temperature probes to capture the reference temperature of each zone, and actuators to control the opening of the motorized grilles and the bypass gate if it exists. The schema below shows an example of zoning system where we have used Touch-MyDesigns like user interfaces in each zone (zone On/Off, setpoint temperature, and reference temperature), and the actuator MAXinBOX8 to control the grilles and the bypass. What values should the mode communication object of IRSC Zone receive? This DPT structure is currently implemented in the InZennio Z38i and Z41 Touch Panels as well as in the IRSC Zone application program, so those devices can be easily integrated in the projects. For further information, please contact our Online Technical Support. Can IRSC Zone limit the range of temperature values settable in each zone? Yes, but the limit defined in the IRSC Zone will affect to all the zones. The limitation particularized for one zone must be configured on the user interface of that zone. Note: the setpoint temperature sent to the machine may exceed the parameterised restrictions (even if the “Temperature restriction” object has the value “1”) in the case of having parameterised a calibration (parameter “Increase (heat) / Decrease (cool) temperature sent to the A/C unit by”) or if the “Temperature returned from external sensor” parameter is enabled. How can I turn off the air conditioner with IRSC Zone? 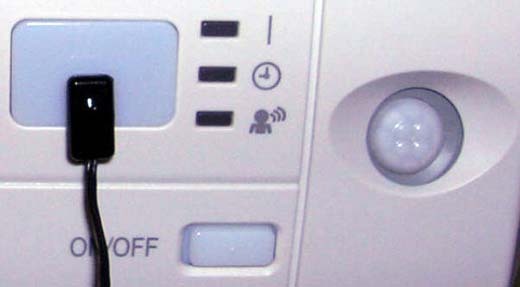 IRSC Zone automatically turns off the air conditioner when all the zones are disabled. 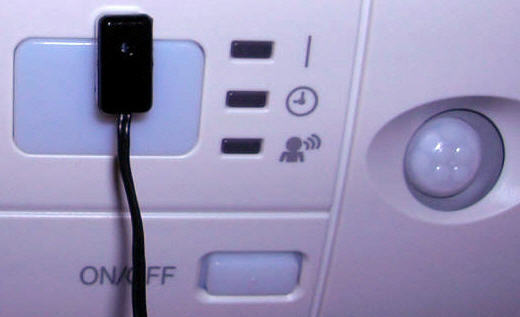 Optionally, IRSC Zone can be set to turn off the air conditioner when all the grilles are closed, even if the zones are enabled. Can I limit the fan speed when there are few grilles open so that the air pressure does not damage the ducts? Yes, IRSC Zone can be configured to set a certain fan speed, medium or minimum, depending on the number of open grilles. Additionally, IRSC Zone can control a motorized bypass and open its gate below a configurable number of open grilles. What is the object "Return temperature external sensor" for? This parameter can be optionally enabled, if a return air duct exists, with the aim of adapting the general setpoint calculation process in certain cases when a heat or cool source is affecting the temperature of the returned air that arrives back to the machine, while it does not affect the ambient temperature of the enabled zones. When enabled, this parameter deploys a 2-byte object, “External Temperature Returned”, to be linked to a KNX sensor located in the return of the machine. See the manual of the IRSC Zone for further information. Note: it is necessary that the external KNX sensor periodically sends the measured temperature (the period should not be more than one hour). In case IRSC Zone does not receive any temperature through the Returned Temperature object within 60 minutes, it will stop taking into account this external temperature for the calculation process. What is the object "Increase (heat) / Decrease (cool) temperature sent to the A/C unit by" for? This parameter allows compensating the heat losses or gains in the ducts. The calculated setpoint according to the setpoints in the zones is increased/decreased in this value. Do you have any example project that can be used as a reference for the configuration of my air zoning system? Yes, in the Support section of our website, within the area of Example projects, you have a number of well documented projects that can serve as a guide for the configuration of different HVAC systems, in particular, the document "Clima III. Zoning" explains all the peculiarities of zoning systems and includes an ETS sample project.